Militant Mondays – Bobby Jindal wants to continue drilling; why??? Whether you believe the BP’s Deepwater Horizon well is spewing 19,000 or 40,000 barrels of oil daily into the Gulf of Mexico, one fact remains constant. We have a catastrophe on our hands and it is getting worse everyday. The oil volcano that continues to leak oil will go down in U.S. history as the #1 environmental disaster. The effects of this oil spill could easily be felt for the next decade (that is a kind estimate); so what is the natural response of Louisiana Governor Bobby Jindal (whose state is being hit hard by the oil spill)? 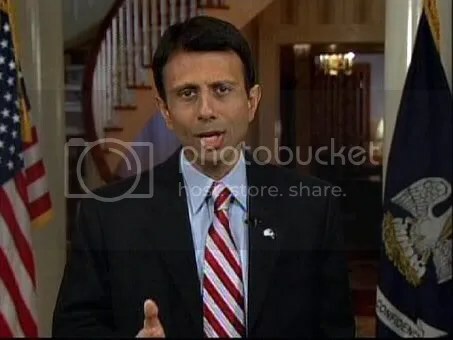 To be honest Governor Jindal didn’t exactly say that, but in a letter to President Obama Jindal has requested that the president lift the temporary moratorium that the president enacted on deep-water offshore drilling. Ummmmm….. So Jindal wants to continue deep-water drilling while we continue to STRUGGLE to cap a deep-water well. A well so deep that BP is trying never before attempted ways (besides drilling a relief well) to stop or actually slow down the amount of oil being spilled into the Gulf. Does this make sense to anyone? Well anyone who is not a part of the GOP? President Obama enacted the temporary moratorium as it became clear that there were several safety issues; as well as that the oil industry knew what it took to drill a deep-water well; BUT had no idea what it took to cap a deep-water well in a worse case disaster scenario. There are several questions about how BP handled this well; safety, the process of requesting permission to drill these wells, the technology, and the procedure to properly cleanup a disaster are just a few that come to mind. So why would Governor Jindal want to continue this unsafe drilling? He claims he is trying to save the jobs of those working on oil rigs affected by the moratorium. But if there are questions about safety is he really protecting the people. What seems to be lost in the Deepwater Horizon Oil Rig disaster is that 11 people died; 11 priceless lives thrown away in the name of COST SAVINGS. This is the industry that Bobby Jindal is worried about; there are 33 deep-water offshore drilling rigs affected by the moratorium. According to the Huffington Post, “of the 33 permitted deep-water drilling rigs that Jindal wants to continue operating, two are under BP leases and two are operating under leases controlled jointly by BP and Devon…”. Imagine if there was a massive safety failure like this in the aviation industry; the National Transportation Safety Board (NTSB) without a doubt would suggest the FAA ground planes or suspend operations for the company guilty of the safety infractions. Why is the disaster in the Gulf any different? Bobby Jindal for whatever reason cannot seem to understand that there are too many unanswered questions as to what happened in this accident. We cannot afford another accident while in the middle of trying to stop the current leak; as for the rig workers out of work. There is no reason why these rich Oil Companies cannot afford to flip the bill to continue paying workers while all rigs are re-checked for safety. Where is Bobby Jindal when it comes to fighting for SAFETY FIRST!! No oil rig should be allowed to operate until they have gone through a thorough safety inspection. No deep-water offshore oil rigs should be allowed to operate until Blow-out Protectors are proven to be safe and actually do its job and PROTECT!!! WTF/WTH Wednesdays – Wanted: Angry Black Man….